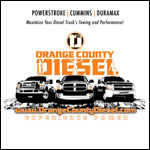 Boosting your truck beyond 450 Rear Wheel Horse Power and keeping the working exhaust temperatures around the 1200 degrees F and at the same time keeping your truck street legal can be a challenge. Yet the BD-1045315 Diesel Polished Super B Twin Turbo Upgrade Kit 1994-1998 Dodge 5.9L Cummins are the ones to say "challenge accepted!" and handle the problem. 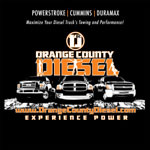 OC DIESEL offers Professional BD Power BD-1045315 Installation.